I found a bunch of these pests on my grape leaf. I zoomed in a bit, but they're quite small in real life. They also seem to be found on leaves with some kind of white or gray fluff (at first glance it looked like a bunch of old spiderwebs crumpled up together, but they're not spiderwebs). Oh, and if you'll notice, this leaf (and quite a few others like it) have this grayish whitish discoloration on it, also feels like velvet. Is it related? I think you've probably got leafhoppers, although I'm not 100% sure. The insect in your picture appears to be a nymph. Some pictures of leafhopper nymphs I've seen look similar. Leafhoppers can be a big problem for grapes, especially aesthetically, but you can still get a harvest with them there. Adults will fly when disturbed. I'm not sure that the damage to the leaf is from the creature pictured, but it's possible. Our leafhopper damage looks a little different. The leaf damage and the white fluff may be from whiteflies. 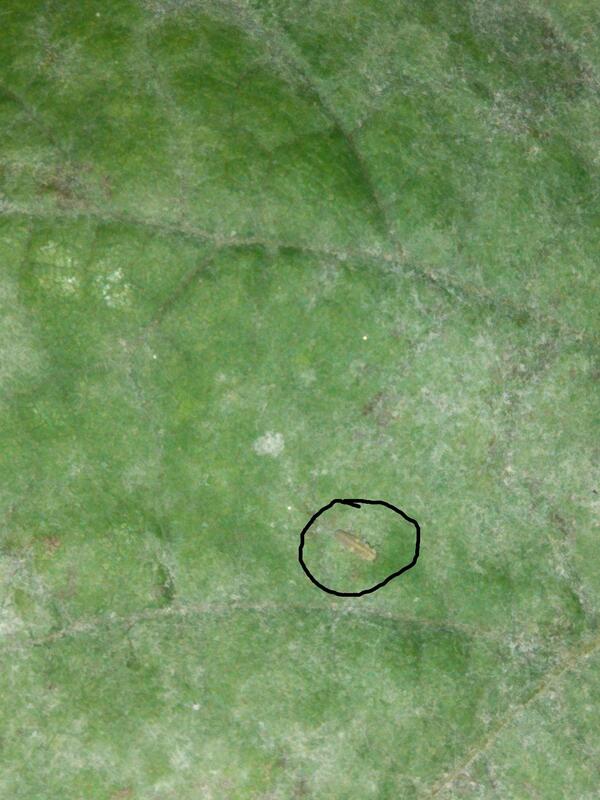 There are no whiteflies or whitefly larva in your picture. To me it looks like spider mite. A very big problem if allowed to continue. All of that mottling means that leaf is unable to make food for the plant and not able to do its job just paying for its own upkeep. We can tell you with more confidence what you are dealing when you send more information and pictures. Do not apply anything until we are able to ID. Go ahead and water the leaves with the hose. Both spider mite and powdery mildew hate free water. Is this beetle on my apricot tree a pest? What Pest is That on My Rosemary? What is this pest attacking an avocado tree? Can someone tell which pest droppings looks like this?